People walk through halls outside of the SHOT Show gun show Wednesday, Jan. 24, 2018, in Las Vegas. 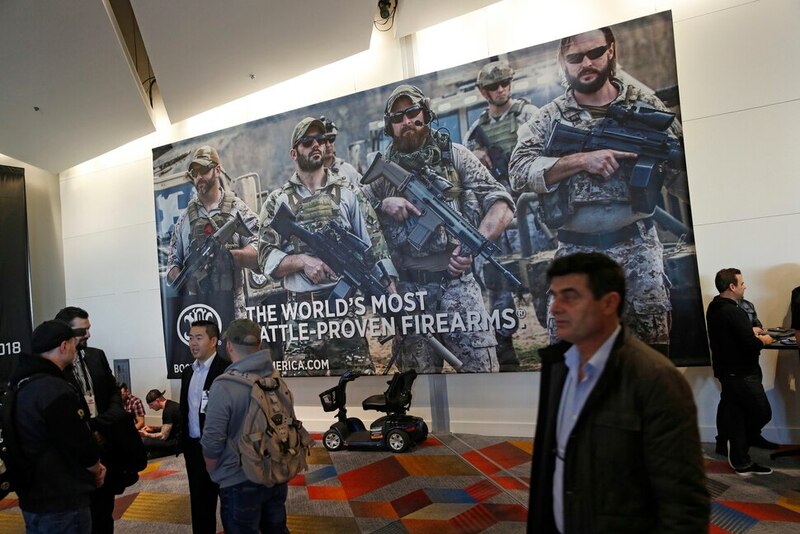 (AP Photo/John Locher) People walk through halls outside of the SHOT Show gun show Wednesday, Jan. 24, 2018, in Las Vegas. (AP Photo/John Locher) (Tom Wharton | Special to The Tribune) Berry's of St. George had a patriotic theme to its booth at the SHOT Show in Las Vegas. Pictured Jan. 23, 2018. (Tom Wharton | Special to The Tribune) Brett Lafferty of Payson's Liberty Safe, stands at the SHOT Show in Las Vegas on Jan. 23, 2018, in front of a vault door the company is manufacturing for homes that may have a concrete storage room under their porches. (Tom Wharton | Special to The Tribune) Taylor Whitney of Utah-based Christensen Arms holds the company's new Modern Precision Rifle at the SHOT Show in Las Vegas on Jan. 23, 2018. (Tom Wharton | Special to The Tribune) Potential buyers examine products Jan. 23, 2018, at the SHOT Show in Las Vegas. (Tom Wharton | Special to The Tribune) The Christensen Arms' booth at the SHOT Show in Las Vegas on Jan. 23, 2018, was crowded much of the day. (Tom Wharton | Special to The Tribune) Barnes Bullets of Mona, which offers a variety of copper ammunition, displays a few at the SHOT Show in Las Vegas on Jan. 23, 2018. Note the two bullets that had been fired and what they look like after they hit the target. (Tom Wharton | Special to The Tribune) Utah's Browning, based in Morgan, shows its line of pistols Jan. 23, 2018. The company is one of the few that has attended all 40 SHOT Shows. (Tom Wharton | Special to The Tribune) A typical rifle display at the 2018 SHOT Show in Las Vegas. (Tom Wharton | Special to The Tribune) aron Cummings examines some of the rifles Morgan's Browning company was offering to gun dealers at the SHOT Show in Las Vegas on Jan. 23, 2018. (Tom Wharton | Special to The Tribune) Jessica Brooks-Stevens shows off some of the new copper-based ammunition manufactured in Mona by Barnes Bullets at the SHOT show in Las Vegas, Jan. 23, 2018. (Tom Wharton | Special to The Tribune) This is one of several levels of the Sands Convention Center, which hosted close to 65,000 people for the 40th annual SHOT Show starting Jan. 23 in Las Vegas. (Tom Wharton | Special to The Tribune) Berry's Bullets of St. George displays its bullets on the SHOT Show floor in Las Vegas on Jan. 23, 2018. (Tom Wharton | Special to The Tribune) Crowds jam a hallway Jan. 23, 2018, filled with small booths at the 40th SHOT Show in Las Vegas. (Tom Wharton | Special to The Tribune) One of the latest products from Mona-based Barnes Bullets on display Jan. 23, 2018, at the SHOT Show in Las Vegas. (Tom Wharton | Special to The Tribune) A gun booth on Jan. 23, 2018 at the SHOT Show in Las Vegas with recruiting poster for the National Rifle Association. Las Vegas • Nearly 40 Utah companies selling everything from rifles to bullets to safes are here for the gun industry’s massive SHOT trade show, gathering more attention than usual because it’s taking place just a couple miles from where a lone gunman killed 58 concert-goers in October. There was little — if any talk — among exhibitors on Tuesday’s opening day of the Shooting, Hunting and Outdoor Trade Show about the deadliest mass shooting in modern U.S. history. Stephen Paddock also injured 851 people in the massacre. SHOT Show has been held for 40 years, half that time in Las Vegas, and this year’s gathering was scheduled well before the attack last fall. A large Las Vegas police presence could be seen in the front of the Sands Convention Center. “No law abiding American should be forced to face evil with empty hands,” read a quote from gun rights lawyer and activist Colion Noir on a giant poster at the National Rifle Association booth. As many as 65,000 people are expected to pack the 12.5-miles of aisles over the four-day event, where 1,850 manufacturers are trying to entice buyers from retailers big and small with dazzling displays of shooting and hunting goods. Business proceeded as normal in the crowded aisles and hallways of the convention center, where everything from tactical law enforcement and military equipment to women’s purses designed to carry a pistol were being displayed. One company promoted a holster that allowed joggers to comfortably carry their concealed weapon. The National Shooting Sports Foundation sponsors the gigantic show drawing sellers and buyers from 111 countries and all 50 states, using proceeds to promote, protect and preserve the hunting and shooting sports industry. Utah was represented by manufacturers producing rifles, pistols, bullets, silencers, reloading supplies, camp stoves, targets, optics, gun safes, camouflage clothing, headlamps, sound suppressors, concealed holsters, concealed gun clips, wraps for outdoor gear and a product that allows a cell phone to be mounted to a scope for long-range photos. Morgan-based Browning is one of the few companies that has attended every SHOT Show since the first one was held in 1979 in St. Louis. Only 290 exhibitors rented space for that first show. “We write a lot of orders,” said Aaron Cummins of Browning when asked about the importance of the SHOT Show. He said that many took advantage of range day on Monday to test out products. Cummins said there is great interest among hunters and sport shooters in long-range rifles. Christensen Arms, a Gunnison-based company known for its carbon fiber rifle barrels and founded in 1995, seems to be growing each year. Its big new product this year is the Modern Precision Rifle, with an all-carbon fiber barrel that marketing specialist Taylor Whitney called the pinnacle of all the company’s engineering. (Tom Wharton | Special to The Tribune) Taylor Whitney of Utah-based Christensen Arms holds the company's new Modern Precision Rifle at the SHOT Show in Las Vegas on Jan. 23, 2018. She said the show is extremely important because it gives manufacturers a chance to interact with other brands. Though now part of Remington, Mona-based Barnes Bullets is another big player at SHOT. Tim Janzen, a research and development specialist for the company, said its all-copper bullets were designed for improved hunting accuracy and to kill efficiently by quickly expanding. There is increased interest in using the copper bullets in southern Utah and northern Arizona, where big game hunters are being discouraged from using lead bullets that can be fatal to California condors. Janzen said there is a similar sentiment in Europe against using more traditional lead bullets. Berry’s, a St. George-based company that produces plated bullets and reloading supplies, offered new plated bullets, ammo cans and tumblers, mainly for those gun enthusiasts who like to load their own ammunition. (Tom Wharton | Special to The Tribune) Berry's of St. George had a patriotic theme to its booth at the SHOT Show in Las Vegas. Pictured Jan. 23, 2018. Payson-based Liberty Safes, one of four Utah County safe companies, celebrated its 30th anniversary with a brochure touting endorsements from conservative commentators including Sean Hannity, Glenn Beck and Dana Loesch. Company spokesman Jamey Skousen said Liberty employs 500 people capable of producing 500 gun safes a day. It has about 350 dealers across the United States. Liberty was displaying a vault door designed to secure large concrete storage rooms often found under front porches in homes. Two smaller Beaver-based companies — Phone Skope and Hydro Graphics — were located in a remote corner of the basement of the giant convention center. Both seemed to be doing brisk business. Phone Skope allows hunters, birders or astronomers to mount a cell phone near the lens, which can then capture clear photos of distant wildlife or stars using the scope’s optics. Hydro Graphics offers a “dip” where everything from guns to snowmobile covers to tire wheels can be coated with a camouflage surface. Miles Moretti, the president and CEO of the Utah-based Mule Deer Foundation, attended the show as an editor of the non-profit’s magazine as well as a buyer. One manufacturer was noticeably absent. Slide Fire, the leading manufacturer of bump stocks, a once-obscure product that attracted intense attention in the aftermath of the Las Vegas mass shooting, was not among the exhibitors. The Texas-based company hasn’t said why it’s not on the roster of exhibitors, although it was last year. It didn’t return messages to The Associated Press seeking comment. The company also isn’t on the list of those attending this year’s National Rifle Association annual meeting or other prominent gun trade shows. SHOT Show, which is not open to the public, runs through Friday. • Nearly 40 Utah manufacturers are displaying their gun and hunting-related goods. • More than 64,000 people expected to attend. • Las Vegas’ seventh largest trade show and 19th largest in the U.S.
• 1,850 exhibitors are displaying their wares. • Exhibitors, buyers and media come from 111 countries and all 50 states. 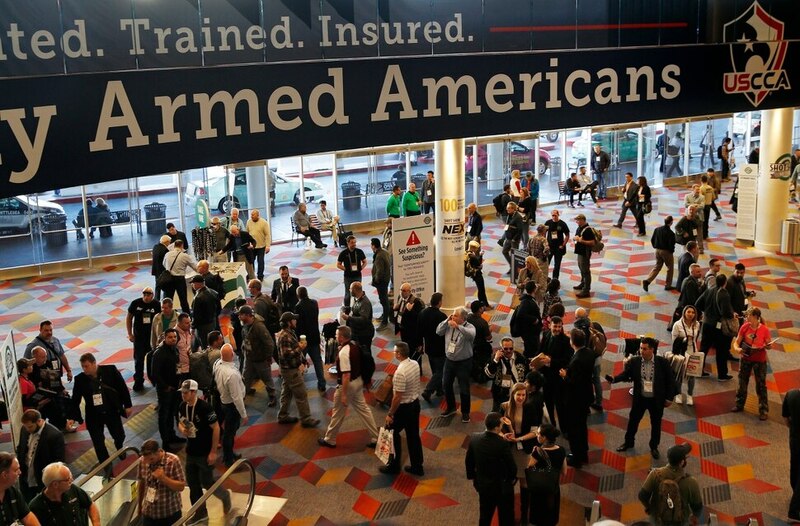 • Firearms and ammunition are an $8 billion industry that support more than 301,000 trade shows. • The show is sponsored by the National Shooting Sports Association, which uses revenue from the event to find programs that promote, protect and preserve hunting and the shooting sports.